"It's important to constantly explore unusual song subjects, and good writers leave no stone unturned." MARY RAMSEY: Well, being the new link in the chain so to speak, I was a little wary of using the 10,000 Maniacs name, for personal identity reasons, expressions of music and individuality. However, now that our album has been out for seven months or so I do see how using the name really was effective in terms of marketing, identifiability, and let's face it, five out of the six members are 10,000 Maniacs, the band. The sound just naturally changed when John and I joined, mostly because of my voice, the body as instrument and the viola all being different, plus the way I write differs from Miss Merchant. But the band does keep the flow of its history. JOHN LOMBARDO: Yes, of course we debated the issue all the way around. We felt that five out of six charter members were still there, a significant quorum; as well as a strongly identifiable sound. If the aura was that different, of course we might have had different thoughts. But back in Western New York among our closest confidantes we were constantly told how the new stuff sounded just like the early stuff, the old band; the music a lot of them actually preferred. As far as Natalie's legacy, we view it as a family sort of thing; we're in it together to make heartfelt, serious music in a world where that's becoming somewhat passe. When Sandy Denny left Fairport Convention, or Richard Thompson, no one assumed there was any kind of animosity or weirdness among the group. Artists ultimately want to project their own complete vision, not always having to translate their creativity through other people's talents and personalities. We all feel that certain band line-ups are the authentic ones – Ronnie Wood has been the Stones' second guitarist for 22 years now, and yet many of us still think he's still filling in for Brian Jones. Going back to the original question, we didn't at all attempt to reinvent the sound. Each of us as musicians, for better or worse, play a certain way. When Rob [Buck] and I play guitars together, the sound coming out is recognisable immediately as 10,000 Maniacs. Same with the others. Mary fits in perfectly, being with the group unofficially for their last two albums and tours (with Natalie). It's difficult to discuss lyrics (and somewhat self-defeating as well), but yes, I would agree that the lyrics are less political. That wasn't a conscious decision, particu­larly. It's just that when I'm strumming on my guitar searching for a chord sequence, the lyrical snippets that pop into my head are rarely political. In this day and age, sadly, that's just preaching to the converted. Lyrically, though, Mary and I were run through the grinder. It's hard enough to come up with lyrics we both agree on, let alone please the whole group. 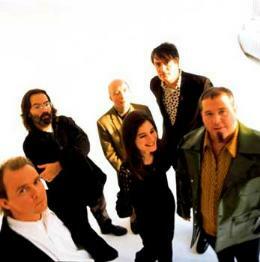 All the songs on Love Among the Ruins are credited to'10,000 Maniacs'. What kind of songwriting method did you devise when working as a full band? Is it very different writing as a group than as a duo? MARY Again, some things are the same, some are different. Someone would bring in an idea for a song, then I put down the melody and chip away at the lyrics. John and I would throw ideas back and forth, come up with the lyrics in a collaborative style, very much like our John & Mary songs. JOHN The decision to share credit was a reaction to the way it had been before. It's no secret that those who get songwriting credit walk off with most of the loot. We felt that the sound of the group was created by everyone (to varying degrees). However, we have never just jammed our way to a new song; that's not the way we've operated. Someone has always presented a chord sequence, partial or almost complete, to the lyricist. When you see the back catalogue, all the words were written after the fact, some actually done at the very last minute during the recording process. On LAtR, some people had more to do with songs than others. I had four musical pieces, helped on two others, and did half the lyrics. Mary really comes up with the melody lines, and All That Never Happens is hers, really, musically. Sometimes it's quite difficult to come up with words to someone else's chord sequence. For whatever reason, lyrics can come quite quickly, almost immediately, or you may chase them around for months. Three songs on the album actually exist in early forms with completely different lyrics and melodies. Working as a duo was a bit easier, if you consider arguing with one person less exhausting than arguing with six. John, when you returned to the band after such a long break, did it feel like you'd been away? Did it feel like coming home? JOHN It didn't feel different at all. I had played on stage with them a few times through the years, and that felt far weirder, by far. But knowing that you're really a part of it once again is quite a comforting feeling. "Happy to know I'm going home" is a sentiment everyone can identify with and the image of travelling home recurs often in your writing. Where do you call home and what does it mean to you? MARY "Home is where the heart is"? I do feel that for me it's not a physical place but a spiritual place of peace – stillness, calm. I've been living in Buffalo for twelve years; I guess I am a resident now, although I have been a vagabond for so long now I do feel like a lot of places around the country feel like home. JOHN Home to me is a place we can never return to, like memories of family Christmases that are long departed.... Since the death of my mother many years ago, a part of me also died. Our youth disappears, our homes get sold and our towns become unrecognisable. But in that silent place in our minds, home represents calm, safety, and love. I am also strongly influenced by zen poems of China and Japan that include numerous allusions to going home as a metaphor for dying. Slaves in America also alluded to death as someone "carrying them home." The longing for home is a universal search, really, for deliverance, redemption, and inner peace. All ultimately unattainable. Is 1990s USA a good place to be living and making music? A lot of your writing strikes us as appealingly nostalgic and the songs' subject matter is rarely rooted in an identifiable period. MARY It is a good place because it's my history; can't really change that, eh? And, yes, John and I are nostalgic. He is more factually nostalgic, maybe because he's twelve years older, but I tend to be emotionally nostalgic. So much of this stems from the transporting quality of classical music – the world of imagination looms large there – and in jazz, folk and blues, some of my favourite styles. JOHN I look at the charts and shudder. The music business has changed dramati­cally in the fifteen years I've been peripherally associated with it. A&R guys will actually tell you they love your music but they can't use it. In private, they may laugh at some of the acts they do sign. People will counter and say that it's always been bad, but it's never been like this. Music traditionally was an uplifting, rallying, celebratory experience. Even sad music was a fable for hope, a way to make people think of ways to improve their lot. As a lyricist, I have always tried to create a non-specific world, a blurry vision of universal experiences. I realise that sounds a bit pretentious, but I do try very hard to write words that aren't immediate first-person reactions to solipsistic ups and downs. A really great song can move different people in different ways, allowing you to have your own interpretation filtered through your own reality. Like Penny Lane – very specifically English, but everyone here can picture it as their own neighbour­hood. Or Itchycoo Park by my favourite band, the brilliant and underappreciated Small Faces. Does the story underlying Green Children betray a fascination with all things Fortean (mysteries of the unexplained) on your parts or does it have more of a metaphorical significance for you? MARY I am a great lover of the night skies, the moon and stars, planets, clouds. They truly mesmerize me. I find space mysterious and do see our lyrics in both a metaphorical and literal way. Exploring unexplained mysteries adds such a spark to everyday life. They are tales that work well with music. Is the title 'Love Among the Ruins' a nod to Browning's poem or Burne-Jones's painting or both? What does the title signify to you? And is your songwriting ever informed or influenced by literature and art? MARY The title came up spontaneously when John and I were writing the song. Then it seemed like the best title for the album because it linked together the overall feel of the album for us. To have love, to hope, allows one to transcend the negative things that life brings. Oh yes, I'm influenced by literature and art; everyone borrows or is inspired by one another in the arts, I believe. JOHN I actually nicked it from a 70s film, with Olivier and [Katharine] Hepburn as former lovers chance-meeting in their autumn years. The Browning poem I read much later. The title has obvious signifi­cance in the 10,000 Maniacs saga, and it seemed to reflect what we wanted to communicate. Mary and I wrote the original lyric to Rob's music, but the A&R guy didn't dig it at all. So Jules Shear had a go at it, and he did a great job. But the title remained, and thematically seemed to anchor the album. As far as songwriting in general, I do often get ideas from literature and art. And to a large extent, film, too. It gets increasingly difficult to come up with fresh themes for songs... The music part is easy. But to come up with concise/mysterious/relatable lyrics every time is quite a challenge. The more things you say in songs, the sheer volume of your catalogue really, diminishes the import of your words to the extent that you repeat yourself so often you bore even your own audience. It's important to constantly explore unusual song subjects, and good writers leave no stone unturned. The sad thing is that United States radio programmers generally don't respond well to these unusual song subjects. And no one gets to hear them. What drew you to the poems of Wilfred Owen back in the early days? JOHN I must say that his is one of the most tragic wartime stories of all. A nineteen-year-old guy, something like that, writing poems in the trenches and getting killed. Eighty years later, those poems are in every high school anthology of literature, and still will be in another eighty years. Brilliant essays on life, responsibility, futility and despair. How did you wind up writing with Jules Shear and what did he bring to the project? Do you enjoy collaboration (with Billy Bragg, Mary Margaret O'Hara, Alex Chilton et al.)? JOHN Mary and I went to Woodstock to work with Jules. It was an experiment, really, that proved rather productive. The chords were all laid out and Jules had an opportunity to come up with melodies and words (although the title Love Among the Ruins was ours, or should I say Brown­ing's?). Good collaboration is a total thrill. Having guests on our John & Mary CDs was a mind-altering experience. Ronnie Lane was my greatest influence, and to play with him in Austin was a memory I'll never forget. Alex Chilton, also, has been a gigantic hero for decades. Add Joey Molland and Martin Simpson, Augie Meyers, Canada's Bob Wiseman and Mary Margaret O'Hara - a real honour. We never told anyone how to do it or how to play it. Hearing these great artists on our tracks still seems incompre­hensible to me. Like a dream. MARY I've always loved collaborating with different artists. To watch and listen to people you admire and respect, let alone write or perform with them is truly wonderful. I was just listening to the stuff I did with Billy Bragg (Don't Try This At Home) and thinking how special that time was. Writing with Jules was really special, too. When we met up with him in Woodstock, NY, we automatically clicked. I just finished singing and playing on his new album, an album of duets he wrote for himself and his friends to perform. When did John Keane and Fred Maher become attached to Love Among the Ruins and how would you describe their contributions? MARY In the second year of this incarnation of 10,000 Maniacs, we asked John Keane to produce most of the tracks on Love Among the Ruins and then in the eleventh hour, John and I wrote Rainy Day and brought [Roxy Music's] More Than This so the band then asked Fred to produce these two tracks because of his drum talents. I really liked working with him. JOHN I'm fully appreciative of [John's and Fred's] talents and insights, but my greatest regret in working with a major label is the intrusion of so many other opinions into what I feel should be band decisions. Being deliberately held outside the process is not much fun and not particularly fulfilling, artistically. Success and failure both seem so much better when they result from something you honestly feel good about. Only the most successful acts today retain a strong creative control over their own stuff — the bean-counters intrude on everyone else's creativity. I wish it weren't true, but sadly, it is. Speaking of producers, was it exhilarating or intimidating to have made the first full length Maniacs album with a legend like Joe Boyd? Did he influence the development of the band's sound at all, back in 1985? JOHN Working with Joe Boyd in the studio was one of the highlights of my musical career. I had been a gigantic fan of his work, and couldn't believe he was actually interested in working with us. To be honest, it was my suggestion, actually, in that no one else in the group had ever really heard his stuff until I laid it on them. Including Natalie. Our music was drifting in that realm anyway, so it seemed like the perfect fit. Looking back, Joe gave us the freedom and encouragement to do things in our own way. Although we were veritable neophytes in the studio, a lot of the charm of The Wishing Chair came from this naivety. Joe told us that he only likes to work with acts he feels strongly about, and as a consequence does very little to intrude on their sound. Hallelujah. Most producers run everyone through their same blender, elevating production values to a level where they supersede the sound and the integrity of the musicians themselves. Choose your own examples, but for me hearing Roy Orbison and Bob Dylan sound like the Electric Light Orchestra was both troubling and discouraging. Plus, today you pay someone a fortune just to make the guitars sound inaudible. The voice and snare are the only sounds the radio finds acceptable. Tell us about the influence of folk and traditional music on your work (more noticeable on the John & Mary records, perhaps). How do they influence your own writing? JOHN I suppose the most significant influence on me has been the understanding that lyrics are the most important aspect of songwriting. Folk traditions evolved from storytelling traditions; the passing on of information across time and space. Obviously, the event or reflection had to be significant enough to warrant such effort, and songs, fables, and minstrelsy all paid great attention to both detail and embellishment. No one else in the band would ever consider themselves folkies; however, our early forays into folk music were the result of Natalie's interest in this new style (fuelled largely by my record collection). Almost the same with Mary, but of course, we stuck a little closer to the real thing. Having Martin Simpson guesting on The Weedkiller's Daughter was so very special for us, really, to be playing with arguably the best traditional guitarist in the world (and of course, receiving nowhere near the acclaim he deserves). I still listen to this style more than any other when I'm home. Even when I'm practising, I play stuff like Banks of the Sweet Primroses. MARY For me, the stories of folk music, and the violin, strings that are present pull me into my past of British Isles music. I do have Welsh and English heritage on one side of my family so it would seem fitting to feel akin to the music. Having played a bit of classical viola and violin, it lent itself so well to folk and traditional music. Also, I've got kinfolk in the south and midwest that influenced me too, a bit. And a fascination with folklore, fairies, wood nymphs, etc - got a bit of elfin blood in me! There's a real sense of longing and unrequited (teenaged?) love on Love Among the Ruins, whether in A Room For Everything or All That Never Happens... do you think first love is the purest love, or the one most likely to disappoint? MARY What I know about love is that there are no absolutes about it. It is an entity unto itself, always changing, always possible, whether it is just felt once or felt time and time again (which is possible). To be able to recognise love within one's self, to share it, to warm lives, energise, is what Love Among the Ruins is about for me. Perseverance, embracing life with courage, gusto! MARY Being asked by you, Neil and Ewen, to do this interview. Being able to continue my love affair with music, to enjoy the natural beauties of the world, nature. To sing or play and in that moment feel a sense of perfection. JOHN Happiness is a journey rather than a destination. And how do you view the future? MARY The future, so intangible, but also tangible? I'll let you know when I get there. Tomorrow!